After watching some films, both commercial and independent, in 2013, some of them were enjoyable to watch while others left me with disappointment. There were films that I laughed; there were films that I cried; there were films that made me keep on the edge of the seat; there were films that made me think a lot. It is a mix of 2013 films that we watched, talked, and discussed about with mixed comments. Without further ado, in no particular order, here are the Top 10 films of the year 2013. Hope (Wish) has made me move into tears that, metaphorically, filled in the whole bucket. Imagine that you might finish have of the tissue box because of trying to wipe of the tears as much as possible. Su Won has not only slowly building up her courage to overcome her tragic incident while the community tries their upmost best in supporting her and her family. The script has in-depth layers of meaning that build up its momentum which shakes the audiences’ heart while their eyes are filled up with tears of joy and sadness. There are times that you will cry followed by, during the in between of emotional scenes, trying to get your senses back from crying too much. This film makes you emotionally drained but it has strong heartfelt content that touches your heart and soul as Su Won, her parents, and others are going step by step in finding the hope of light at the end of the dark path. Hide and Seek will keep you on the edge of the seat as Sung Soo and his family survive and escape from the mysterious person. The focus on two locations settings presents significant differences on the social status and living lifestyle. Also, the film emphasizes on Sung Soo and the mysterious person who have their own personal illness. While Sung Soo finds out the truth about his brother, he has to not only to overcome his fear and illness but he also protects his family from getting hurt. The shocking truth about mysterious person going into people’s home slowly reveals as the plot begins to build up. This film will give you so much shock that you would shout out loud unexpectedly. The scenes from Hide and Seek are surprisingly way beyond my expectations that I slowly recovered my mental consciousness. Although Terror Live is set within the small broadcasting station, it brings the audiences to the situation about the terrorist bombing that is reported live on the spot. With multiple camera shots and Ha Jung Woo’s different facial expressions, these don’t bore the audiences as the shifts of different style in one single location keep the audiences excited about what is going to happen to the hostages at the bridge and Yoon Young Hwa. The charismatic Ha Jung Woo focuses a lot on building both dialogues and emotions in various ways which will not make the audiences feel bored with the film. There is a character development on Young Hwa as he tries to get back being the main anchorman but soon realize that his greed is followed by losing trust with his colleagues and the decisions he made. A game of animal chess where surveillance team, led by Detective Hwang, catches the criminal group, mysteriously led by the leader, Jason. This will keep you focus on how each team utilizes their own strategy in chasing and escaping from each other. While the catchy conversations between their own comrades take place, they move into action in the city as the cameras follow along with the characters running from one place to another. The casts, who played their certain roles for the first time, have made clear cuts in portraying the characters with their own individualities. This team are in action, physically and mentally, to catch the baddies. For those who love to watch action films, Cold Eyes is one of these films that you should watch. 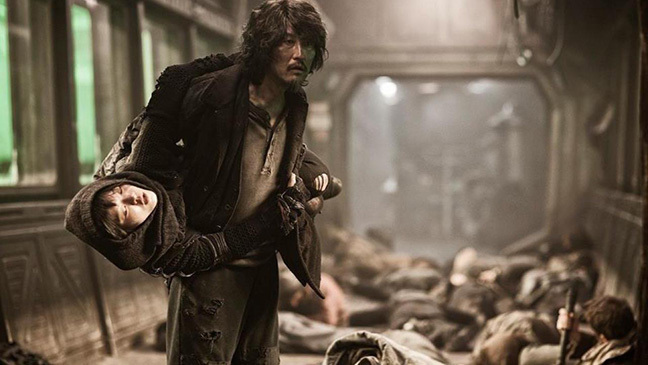 The Flu is a must-see Korean disaster film. It never disappoint me because Director Kim didn’t put so much common and disappointing cliches like other disaster films. First, you are welcomed with the introduction of characters and a bit of laughter. Later, once the virus starts to cause a huge outbreak, it shifts the whole mood into the shocking moments of surviving and saving their loved ones from dying. The casts have done well in bringing the laughter followed by tears. It brings out the messages which make the people wonder what would or they experienced when there is an outbreak on flu and/or diseases. The cinematography adds in a lot of intensity and anxiety on the visual scenes that are disastrous and shocking. While the film is entertaining to watch, emotions arouse from watching the visual shocking scenes and the characters’ strong dialogues. Pluto has a steady pace of shifts in between of two time frames so that the audiences will know about Yoo Jin’s death and Joon’s reason on seeking revenge on the secret group. It is quite slow but it set the audiences’ mind into deep thoughts on how these situations actually happen while putting the puzzle pieces together. At the same time, Pluto gives a clear idea about how the South Korean education system goes by presenting some examples such as getting into the top 1%, believing in myths about getting high grades, taking private tuitions and others. From start to finish of Pluto, it leads to the question to whether the students are happy with their intense studies. This is done by having Joon, as the main character, to question about his own life and studies. The film will make you think a lot but the messages are clearly shown in Joon’s past and present of student life. Director Hong has his own filmmaking mis-en-scene that are recognizable in the films like Nobody Daughter’s Haewon and Hahaha. Although it is quite confusing for the mainstream and commercial audiences to understand, but for those who really love films and/or studied film know why Director Hong always naturally follows the character around with the camera while not having so much editing. Our dear Sunhi is confused about her own decisions and personality even though the three men have been advising her what to do. All of them know each other but didn’t come together as a group to meet up while Sunhi, in the end, mysteriously go the place where they don’t know of. Sunhi ‘secretly’ meets all three men who have their personal situations they need to deal with. It will take a while to understand Our Sunhi but, it has an honest storyline and unique individualistic filmmaking style. The film is one of the Director Hong’s films with recognizable elements. Secretly Greatly leaves the audiences with laughter and tears from start to finish. Although the storyline is quite standard, it grabs the audiences’ attention with lots of action as the cameras follow the characters who are jumping and running along the alleys and on the rooftops. Besides that, the sentimental value is shown by showing Ryu Hwan, Hae Rang, and Hae Jin who are longing for home. Ryu Hwan’s love and compassion on his real mother and adopted mother touches the audiences’s heart and mind as they will feel grateful about how much the mothers have raised and loved them since young. It is true that there is not much character development and lack of balance for the three main actors. Yet, the storyline doesn’t seem to have so many missing gaps in between. Two parts of The Berlin File influences the audiences to think and then fasten their seatbelt for some ground-breaking and continuous action scenes. After Jo Sung finds out the truth, he escapes, together with his wife, from being captured and killed by the North Korean government. While Jo Sung is in action, he has sentimental emotions toward his wife whom he tries to convey his thoughts and feelings to her even though there is a barrier between them. He is longing to get back to the normal life with his family but the authority’s power gets in his way. The fist fighting and shooting scenes keep the audiences uptight and blow their minds away. With high budget in filmmaking at Berlin, the film has made it in pulling the international audiences to watch it because of its action scenes and storyline. The computer-generated gorilla, Ling Ling, is the animal friend that we would love to have. For a 3D film that is made of the first time, it is a good try in implementing technology into filmmaking. The team has put in a lot of passion in creating the gorillas that look real and editing scenes which were taken with many shots including recording through the green screen. The film also has an emotive storyline about the relationship between humans and gorilla that made the audiences laugh and cry. It is enjoyable to watch how Wei Wei and Choong Su communicate with Ling Ling. A wonderful chemistry between Jiao Xu, Sung Dong Il, and computer-generated Ling Ling. Mr. Go‘s production team has put both technology and engaging storyline that bring them to the home run with victory. There are far better films like Snowpiercer that I really want to watch. Sadly, I didn’t get the opportunity to watch in the UK. If I was able to do so, then Snowpiercer will be on this list. The year 2013 has certainly bring a great deal of films that focus on action, mystery, and thriller that shakes the whole world and being in the international film stage where the audiences can watch. Not only the commercial films, but also independent films are given the chance to be known by both local and international audiences. Here’s to even more better Korean films in 2014 to be shown to the audiences through cinemas, DVDs, film festivals, and other platforms.